THE HEAD of the U.S. empire paid a three-day visit to the praetorian guard of the Middle East oil lake that concluded March 22. President Obama’s trip to Israel aimed to shore up anxious vassals and reassert U.S. political and military hegemony in a region in the midst of revolutionary turmoil and economic instability. On both fronts, he appears to have succeeded, for now. News of President Obama’s much-heralded visit has focused on two events: his speech in Jerusalem and the phone call he choreographed between Prime Minister Benjamin Netanyahu and Turkey’s Prime Minister Recep Tayyip Erdogan. As is usually the case with acts of diplomacy, Obama’s speech and telephone rapprochement were filled with unctuous platitudes to mask the crude reality. As Dr. Martin Luther King said on the day before he was killed–“I may not get there with you. But I want you to know that…we, as a people, will get to the promised land…” And while Jews achieved extraordinary success in many parts of the world, the dream of true freedom finally found its full expression in the Zionist idea–to be a free people in your homeland. Like every U.S. president since Truman, Obama depicts Israel as an expression of the democratic yearnings of an oppressed people, as opposed to being an imperial manipulation of historical crimes against the Jewish people to justify a colonial-settler state on Palestinian land. Israel is a nation that’s come to serve as an outpost for U.S. imperial interests in the region. No doubt, Obama glimpsed the 25-foot-high, 450-mile-long apartheid wall that has been condemned as illegal in the International Court of Justice. He knows of the growing civil disobedience against Israel’s illegal occupation of Palestinian land and the broadening resistance to the indefinite detention of Palestinians such as Samer Issawi, now on hunger strike more than 245 days. It’s quite likely Obama’s awareness of all these factors compelled him to reference Palestinian suffering and aspirations in his speech–if only to give a nod toward a crisis he has no intention of resolving. After all, if Obama were intent on actually doingsomething, then millions of American taxpayer dollars that help finance the expanding illegal Jewish-only settlements in the West Bank would dry up. 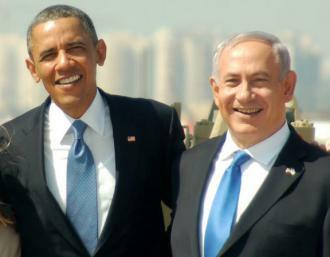 Weapons sales and high-tech deals between the U.S. and Israel would be placed on hold. Obama would demand an immediate end to Israel’s siege of Gaza, a blockade of goods enforced since 2009. Netanyahu’s new hard-right cabinet filled with open racists and opponents of any Palestinian state would have been challenged. Yet none of these actions were even considered. WHEN IT comes to Obama in Israel, as at home, it’s crucial to follow the money and the weapons, not the words. The phone call Obama arranged between Netanyahu and Turkey’s Erdogan was an effort to confront the central geostrategic issues hanging over the entire visit. Containing Syria’s ongoing revolution and stanching Iran’s supposed nuclear weapons development were central to this diplomatic mission. On the surface, the call was about Netanyahu apologizing to Erdogan for a raid by Israeli commandos on an unarmed Turkish humanitarian flotilla, the Mavi Marmara, that killed nine activists on board the ship in the middle of the night in the Mediterranean Sea in May 2010. The three-way call established that Israel will pay reparations to the families of the dead and Turkey will cease legal actions against Israel for the cold-blooded murders of the nine. Whatever words were uttered about easing the years-long blockade of Gaza, little is likely to change on that front so long as Israel controls the flow of goods, resources and people in and out of Gaza. But the real point of the call was for Obama to formally reconcile two of his most important and comparatively stable allies in the region. Containing the two regional powers, Iran and Syria, is far more difficult without unity between Israel and Turkey. AND OBAMA needs a beefed-up guardian in the Middle East gateway to Asian expansion westward as part of his overarching mission to push back China, too. It’s become clear to both the U.S. and Israeli administrations that their longtime ally in Syria, the dictator Bashar al-Assad, can no longer hang on to power in the face of a popular uprising, which began as a revolutionary upheaval and now appears to have become a civil war that’s killed at least 70,000. Even before Obama landed in Tel Aviv, Israeli and U.S. warmongers were peddling unconfirmed reports of chemical weapons being used in Syria in order to pressure the Obama administration to approve direct U.S. military involvement there. Turkey, Israel and the U.S. had already been working behind the scenes to select a Syrian-born American, information technology executive Ghassan Hitto, to be the first “prime minister of an interim Syrian government” elected by the unrepresentative, Western-backed Syrian National Council. As for Iran, Israel would prefer a direct hit against Tehran for its supposed development of nuclear weapons, but the U.S. imposition of deadly sanctions on that country will do for now. And diplomacy is quickly jettisoned when the U.S. and Israel collude in illegal targeted assassinations of Iranian nuclear scientists, as they did in early January 2013. While some may see hope in Obama’s soothing words for Palestinians and others seeking justice in the region, such hopes in Obama are misplaced. The relationship between the U.S. and Israel must remain sacrosanct. They need each other desperately now, as even Muslim Brotherhood allies over the border in Egypt are facing broadening opposition from strikes and protests. In a dangerous world with shifting alliances, military and economic competition and depression, the U.S. empire needs its loyal Israeli vassal more than ever.